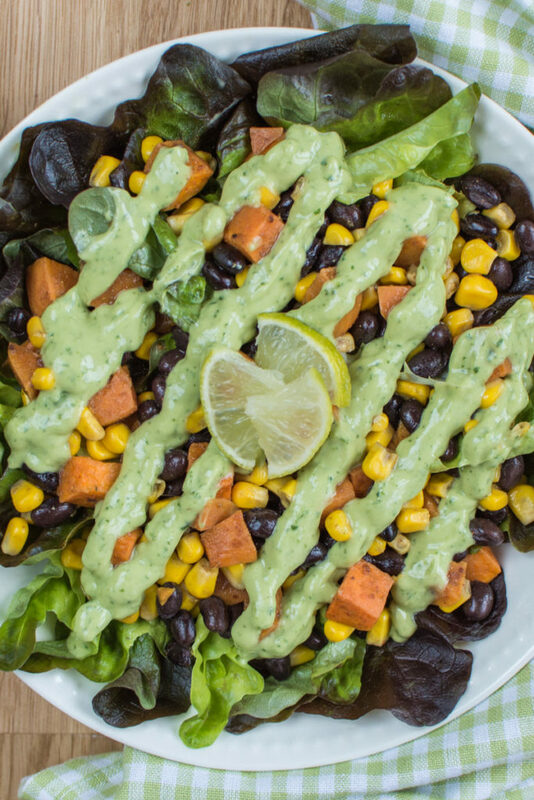 Roasted Sweet Potato, Black Bean and Corn Salad with Avocado Yoghurt Dressing is a very tasty and healthy salad. It contains not only fiber and carbohydrates (sweet potatoes and sweet corn) but also proteins (black beans) as well as healthy fat (avocado and olive oil) and therefore it will fill you up for hours! 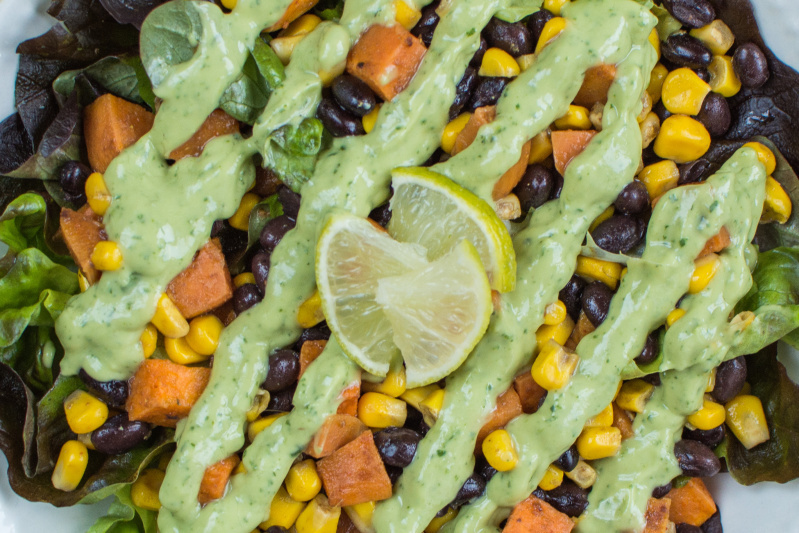 If you like particularly sweet potato, avocado, and cilantro, you will love this salad! 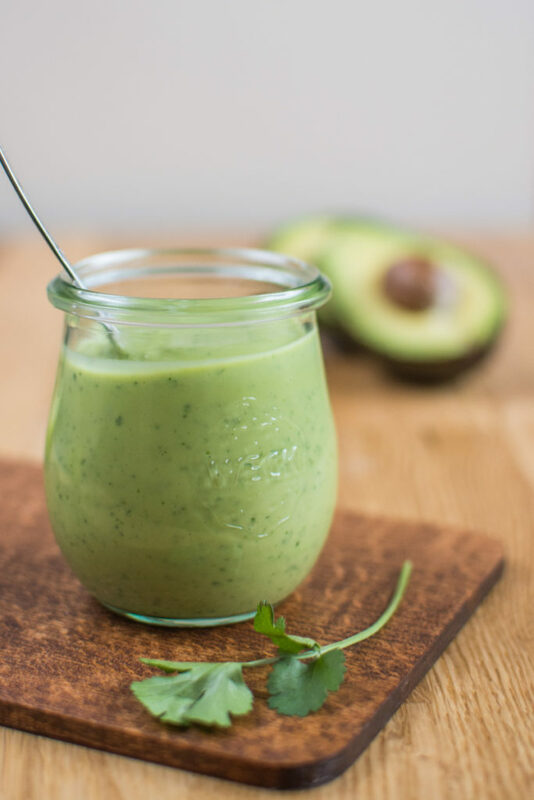 …In the meantime, you can make the avocado, yogurt, and cilantro dressing with garlic which gives the salad an excellent aromatic taste! Then you just assemble all the ingredients for the salad and pour the avocado dressing over it. Enjoy! This salad is full of flavors, a bit spicy, but delicious complete meal! Preheat the oven to 200°C. 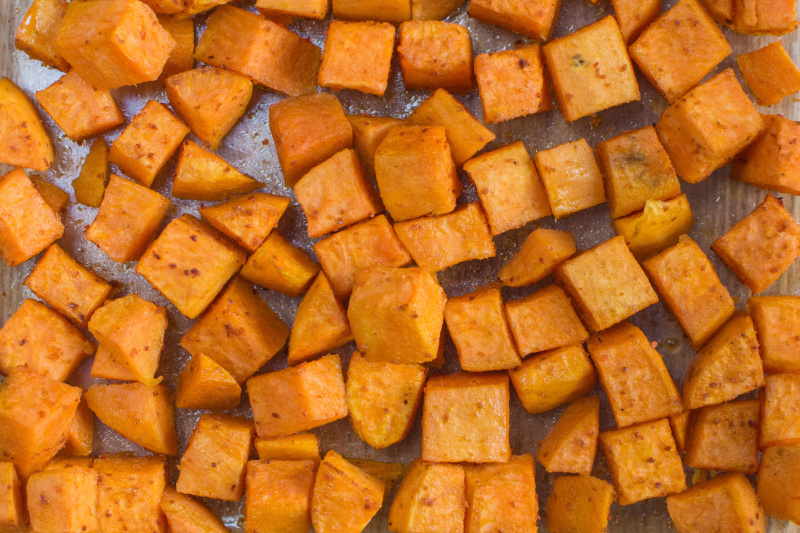 Peel sweet potatoes, chop them into small cubes and place them in a small baking pan. In a small bowl, mix the olive oil together with ground chilli, cumin, and salt. Toss the sweet potatoes with the spiced oil and place them in the oven for about 25-30 minutes or until soft and tender. Drain the beans and corn. Wash and drain the lettuce leaves. Make the avocado dressing: cut the avocado in half, remove the stone and scoop the avocado flesh out from the shell. Put it into the food processor together with all other ingredients and mix until smooth. Mix the roasted sweet potatoes with black beans and corn. 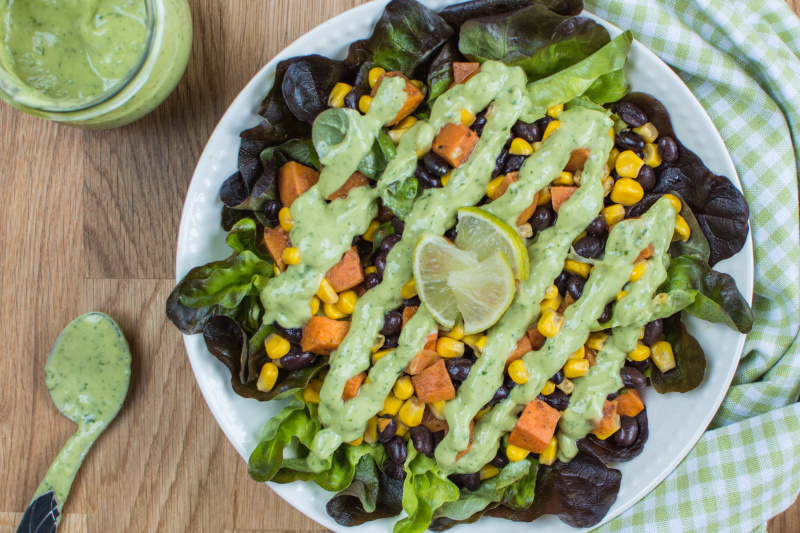 Place the lettuce leaves on a plate, add the sweet potatoes, beans and corn mix and toss with the avocado dressing. 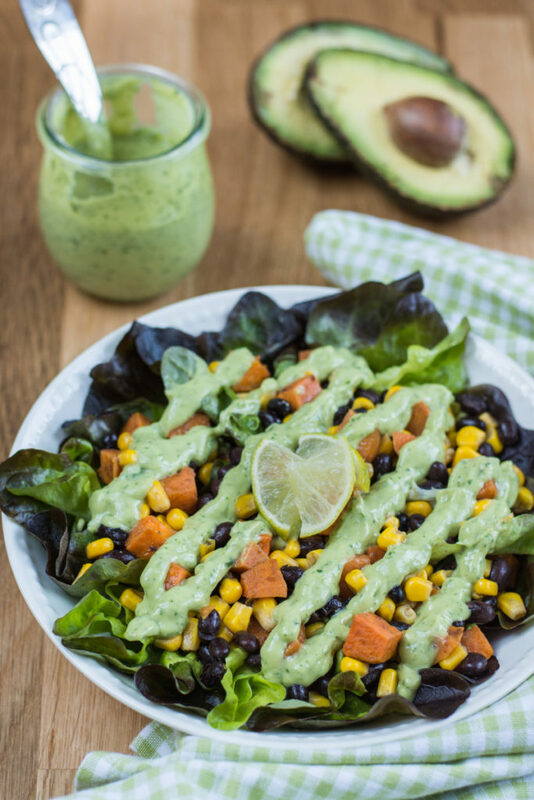 Have you tried this Roasted Sweet Potato, Black Bean and Corn Salad with Avocado Dressing? This looks amazing! Going on my meal plan for the week. We are avocado obsessed in my house. Thank you Jacqui! Haha, me too, I eat a piece of avocado almost every day now :-S but still not sick of it… Let me know how you liked it!